Here, Daisy models Strawberry Fair, a calf-length Disco Girls grannie dress, which was originally accessorized with a long, thin green sash and boots. If this new Daisy looks a little strange, it's because her head is slightly smaller. 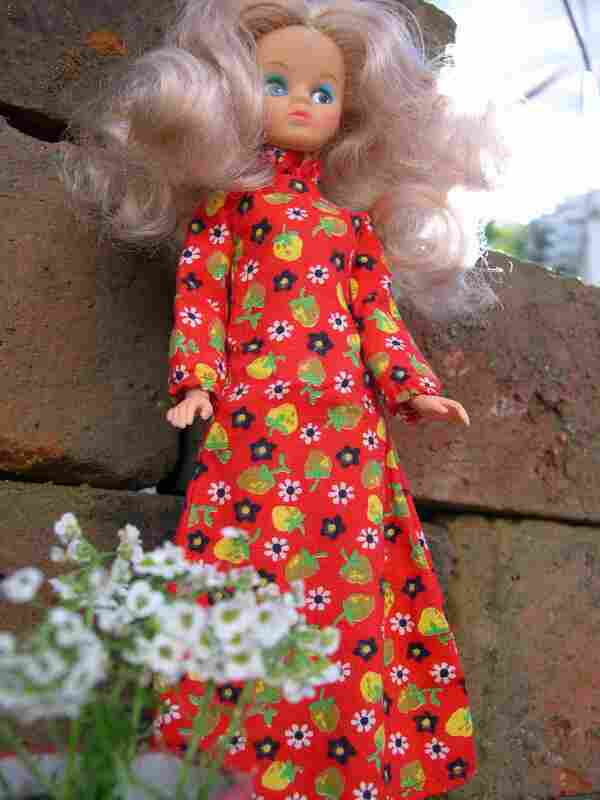 Daisy's noggin shrank steadily through the 1970s, until she looked quite unlike Quant's original. I am a devotee of the balloon-headed Daisy, who looks especially cool now that Japanese anime has inspired the appearance of spunky-looking big-brained dolls. The rubber in this Daisy's head is not only ashen in cast but grainy, and it has started to fade around the hairline.